The essence of what we believe is called "the gospel". The gospel is good news; good news of great joy. It is the foundation of what we believe, and what keeps us from becoming a religion. It has changed us and continues to impact us everyday. Sing to the Lord, for he has done glorious things; let this be know to all the world. The Gospel of Jesus Christ is news, good news: the best and most important news that any human being ever hears. This Gospel declares the only way to know God in peace, love, and joy is through the reconciling death of Jesus Christ the risen Lord. 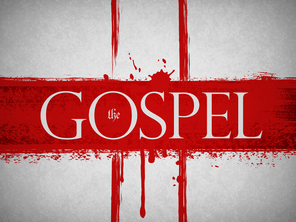 This Gospel is the only Gospel: there is no other; and to change its substance is to pervert and indeed destroy it. This Gospel is so simple that small children can understand it, and it is so profound that studies by the wisest theologians will never exhaust its riches. The heart of the Gospel is that our holy, loving Creator, confronted with human hostility and rebellion, has chosen in his own freedom and faithfulness to become our holy, loving Redeemer and Restorer. The Father has sent the Son to be the Savior of the world (1Jn 4:14): it is through his one and only Son that God's one and only plan of salvation is implemented. So Peter announced: "Salvation is found in no one else, for there is no other name under heaven given to men by which we must be saved" (Ac 4:12). And Christ himself taught: "I am the way, the truth and the life. No one comes to the Father except through me" (Jn 14:6). Through the Gospel we learn that we human beings, who were made for fellowship with God, are by nature that is, "in Adam" (1Co 15:22) dead in sin, unresponsive to and separated from our Maker. We are constantly twisting his truth, breaking his law, belittling his goals and standards, and offending his holiness by our unholiness, so that we truly are "without hope and without God in the world" (Ro 1:18 32, 3:9 20; Eph 2:1 3, 12). Yet God in grace took the initiative to reconcile us to himself through the sinless life and vicarious death of his beloved Son (Eph 2:4 10; Ro 3:21 24). The Father sent the Son to free us from the dominion of sin and Satan, and to make us God's children and friends. Jesus paid our penalty in our place on his cross, satisfying the retributive demands of divine justice by shedding his blood in sacrifice and so making possible justification for all who trust in him (Ro 3:25 26). The Bible describes this mighty substitutionary transaction as the achieving of ransom, reconciliation, redemption, propitiation, and conquest of evil powers (Mt 20:28; 2Co 5:18 21; Ro 3:23 25; Jn 12:31; Col 2:15). It secures for us a restored relationship with God that brings pardon and peace, acceptance and access, and adoption into God's family (Col 1:20, 2:13 14; Ro 5:1 2; Gal 4:4 7; 1Pe 3:18). The faith in God and in Christ to which the Gospel calls us is a trustful outgoing of our hearts to lay hold of these promised and proffered benefits. This Gospel further proclaims the bodily resurrection, ascension, and enthronement of Jesus as evidence of the efficacy of his once-for-all sacrifice for us, of the reality of his present personal ministry to us, and of the certainty of his future return to glorify us (1Co 15; Heb 1:1 4, 2:1 18, 4:14 16, 7:1 10:25). In the life of faith as the Gospel presents it, believers are united with their risen Lord, communing with him, and looking to him in repentance and hope for empowering through the Holy Spirit, so that henceforth they may not sin but serve him truly. "The Gospel of Jesus Christ: An Evangelical Celebration" © 1999 by The Committee on Evangelical Unity in the Gospel, P.O. Box 5551, Glendale Heights, IL 60139-5551.